The most amazing thing happened to me last night..... I made my own green curry paste from scratch, and then I relived my entire 3 months in Thailand in one single bite. I have been searching for this precise flavour ever since December 1st, 2001, when I left Thailand. No store bought curry paste has even come close to that authentic Thai flavour, because in Thailand everything is cooked up fresh, from scratch. 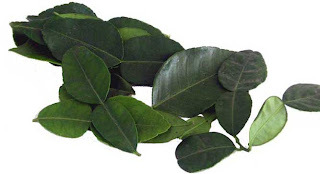 My hope was restored when I found kaffir lime leaves at the market. These turn out to be an ESSENTIAL ingredient in Thai curries. 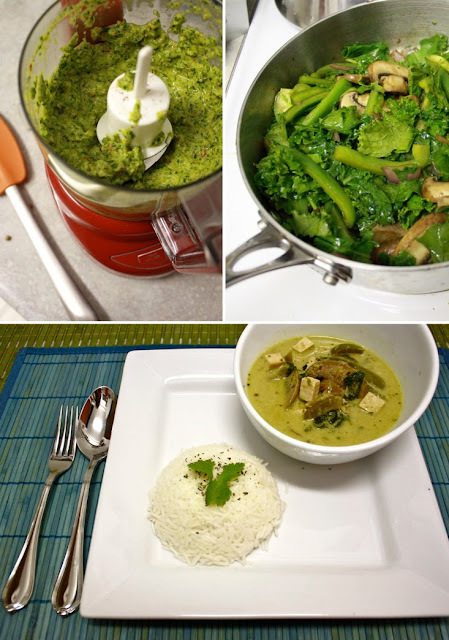 I then dug out my old recipe book that I bought in Thailand so many years ago, (which I've never used because of missing key ingredients), and then whipped up the best green curry I've tasted in 9 years. 1. Stir fry onions in oil for a few minutes, then add mushroom and cook for approx 5 minutes. Then add green pepper, kale and soy sauce. Cook for a few more minutes, stirring, until kale has started to wilt. Then add tofu pieces. 2. Poor in coconut milk and soup stock. Mix in sugar. Cook on medium heat for approximately 5-10 minutes. Serve with rice, and garnish with fresh basil.